A man who left a Liverpool fan in a coma in an attack outside the club's Anfield stadium ahead of a Champions League semi-final tie has been jailed. Simone Mastrelli pleaded guilty to attacking Sean Cox, 53, who was left with brain injuries, before Liverpool played Roma last April. 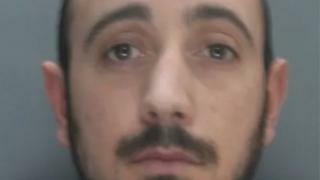 At Preston Crown Court, Mastrelli, 30, from Rome, was jailed for three and a half years. Mr Cox, of Dunboyne, County Meath, suffered severe head injuries. Mastrelli, who was extradited last month after being arrested on a European Arrest Warrant in Italy, picked out Mr Cox because of the Liverpool scarf he was wearing. The balaclava-clad Italian was at the fore of a group of between 50 and 60 of Roma's "Ultra" fans - many covering their heads and faces and some carrying belts as weapons. The court heard Mr Cox and his brother, Martin, had "sadly by pure coincidence" come across the group in Walton Breck Road, near The Albert pub. Mastrelli knocked Mr Cox unconscious with a single blow to the face. He has been undergoing treatment at the National Rehabilitation Hospital in Dun Laoghaire for a "profound" brain injury which has left him unable him to communicate his needs, the court heard. Prosecutor Keith Sutton said: "The reality is that he is unlikely to live independently again." The court heard that prior to the attack, the sales director was a "busy husband and father of three children". Speaking as Mastrelli watched from the dock, Mr Cox's daughter, Shauna, read a personal victim statement. "Before this brutal and vicious attack my dad was a fit and confident man, a man of integrity with a huge passion for life who represented everything which is good. Judge Mark Brown said Mastrelli delivered the blow and then "went into the stadium to enjoy the match, which was particularly callous given what had just happened". Mastrelli fought extradition in several appeals before he was brought to the UK last month. Alison Gurden, mitigating, said he was a family man himself and was "distraught" at the suffering he had caused. Mastrelli entered a guilty plea to unlawfully and maliciously inflicting grievous bodily harm on Mr Cox. He pleaded not guilty to a separate count of violent disorder, which he was told would lie on file. Another Roma fan, Filippo Lombardi, 21, was cleared in October of inflicting grievous bodily harm on Mr Cox, although he was jailed for three years for violent disorder. A third man, Daniele Sciusco, 29, from Rome, admitted violent disorder and was jailed in August for two and a half years.